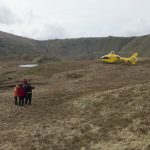 The Team were requested to assist Cumbria Fire and Rescue in tackling a large grass fire on the slopes of Grange Fell, Brund Fell and Joppelty How. Because of the difficult topography, Team members were asked to support fire crews by assisting with local knowledge, logistics and welfare, as well as providing an emergency backup in the event of injury. A Team member was airlifted by the Northern Police Helicopter to assist is plotting where the fire had spread to, and members on the ground also reported local hotspots. Initially the area was reported to be very large, and fire crews from across northern Cumbria were mobilised to assist. 17 Team members – 3 hours 32 minutes.